I absolutely love growing or buying in season produce that I can preserve and use all year long. There’s nothing quite like the flavor of fresh, in season strawberries which is why I freeze them in the spring for making smoothies the rest of the year. 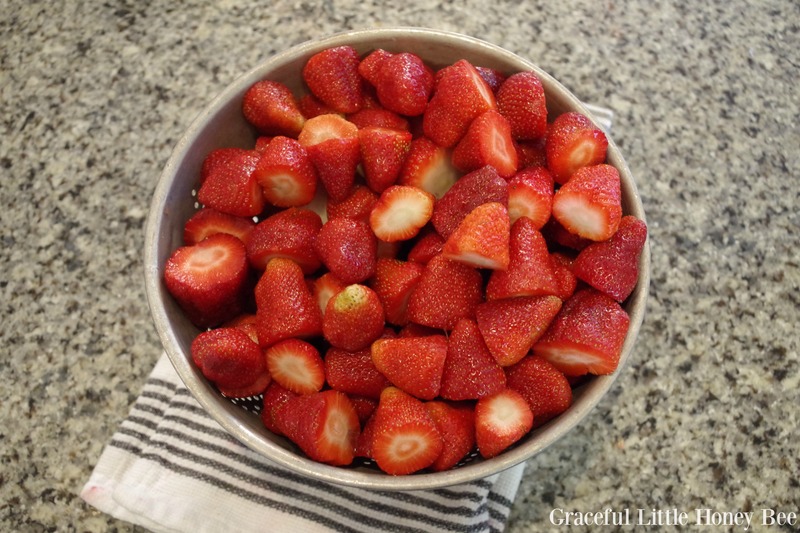 The kids and I LOVE to go pick fresh strawberries every spring and luckily, berries are one of the easiest things to freeze, so I’m excited to share with you how to do that today. You can also check out my tutorial on How to Freeze Blueberries and if you have an abundance of fresh strawberries, be sure to check out my recipe for 3-Ingredient Strawberry Freezer Jam. It’s a super simple recipe for making jam, no cooking required. 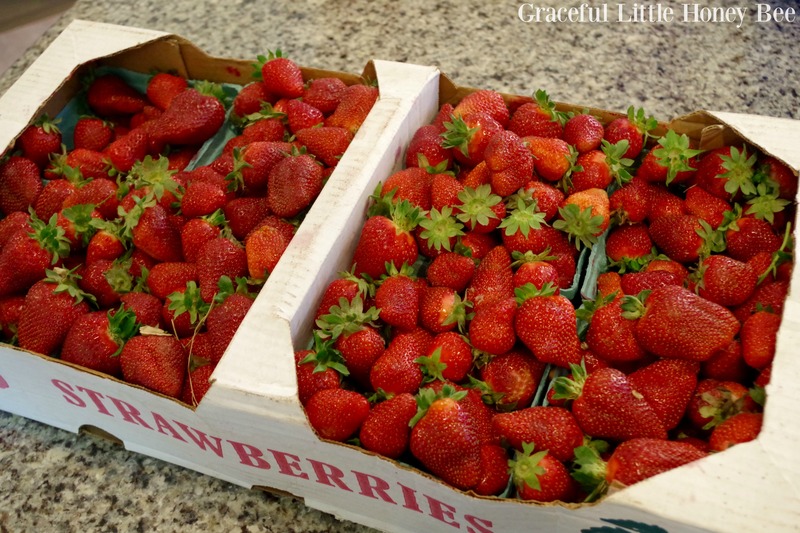 Alright, are you ready to start freezing some fresh strawberries? 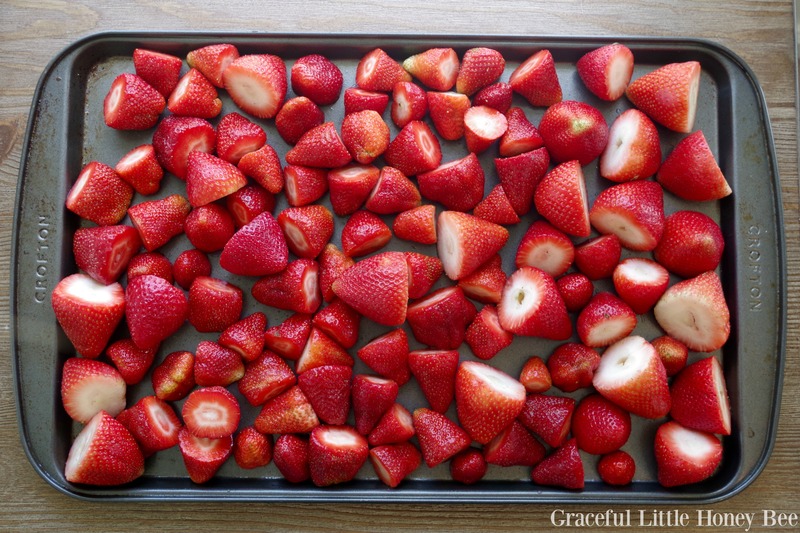 Let’s get started with the easy tutorial on How to Freeze Strawberries. Step 1: Choose ripe, blemish free berries. Step 2: Rinse berries and slice green tops off. Step 3: Pat dry with towel. Step 5: After one hour has passed, remove berries from freezer and place in a labeled freezer bag. Close bag removing as much air as possible. Step 6: Freeze flat. Will last 6 months in freezer and up to one year in deep freezer. Now you can enjoy that amazing in season strawberry flavor all year long! If you’re interested in learning how to make fresh 3-Ingredient Strawberry Freezer Jam, then check out my video below and have a great day friends! Thank you for sharing all your tips. They are always so nice to read and use when you send out an email to me. Love watching your videos too. You are one smart woman! 😊 Blessing to you and your family! Because they're in season, I was just thinking about stocking up at the grocery store, but I wasn't sure how to freeze them! What a timely post! Once they're frozen, can they be thawed and eaten plain or best in smoothies/other recipes? They will be mushy and not good to eat raw after they have thawed. Can they be used in infused waters? How do you freeze them so they dont turn out mushy after thawing? They will be mushy if you thaw them. They won't be good for fresh eating, just for baking, making smoothies, popsicles, jams, etc. How do you freeze pears? What do you need to do. ? They are qourtered and peeled. A regular freezer that is attached to your refrigerator won't keep food as long as a deep freezer because you will be opening it more often.